Although born in Brooklyn, New York, “Dev” had an almost mystical and spiritual belief about an Ireland that he wanted to exist. 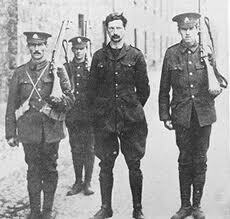 De Valera was one of the leaders of the 1916 Rising and only avoided execution because of his American citizenship and/or the general revulsion about the execution of the 1916 leaders. He was an immensely astute (manipulative) politician and a natural leader of the Sinn Fein TDs elected in the 1918 election. His standing amongst his fellow TDs is evidenced by his being elected President of the first Dail Eireann (Irish Parliament) by a unanimous vote. During the War of Independence, he spent many months in the United States drumming support and finance for the Irish cause. It is not clear why he did not get directly involved in the Treaty negotiations in London. Instead, he sent Michael Collins to negotiate on behalf of the Irish people. The signing of the Treaty on Dec 6th provided legislative autonomy for twenty six counties of Ireland, but resulted in the partition of Ireland and the foundation of the state of Northern Ireland. De Valera refused to accept the January 1923 vote of Dail Eireann approving the Treaty. Soon Ireland was again in a bloody conflict, but this time it was Irishman against Irishman in a vicious conflict laced with atrocity after atrocity on both sides. 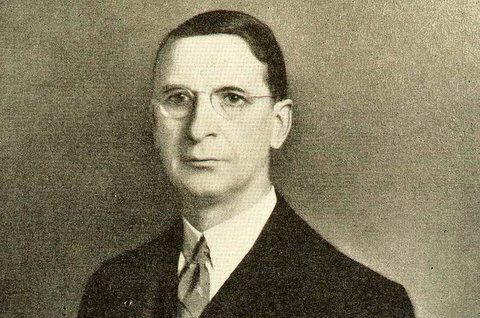 Disillusioned with Sinn Fein and its abstentionist policies, De Valera founded Fianna Fáil in 1926. In order to take his seat in the Dail in 1927, he accepted the oath of allegiance (to the English crown) stating it to be but an empty formula. Fianna Fail came to power in 1932 and dominated the Irish political landscape for most of the century. The “brilliant but austere De Valera” (in the words of JFK) brought international opprobrium on Ireland when he visited the German ambassador in Dublin to offer condolences on the death of Hitler. In 1959, after thirty-three years at the head of Fianna Fáil, Eamon de Valera resigned as leader and Taoiseach and was elected President of Ireland (succeeding Sean T. O’Kelly), a position he held until 1973. 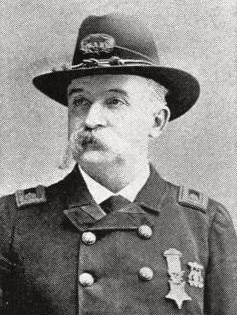 During the Korean Expedition FOUR Irishmen were awarded the Medal of Honor. The President of the United States of America, in the name of Congress, takes pleasure in presenting the Medal of Honor to Private Michael McNamara, United States Marine Corps, for extraordinary heroism in action on board the U.S.S. Benecia during the capture of the Korean forts, 11 June 1871. Advancing to the parapet, Private McNamara wrenched the match-lock from the hands of an enemy and killed him. The ongoing riots in Belfast partly spawned by the Loyalist victory in defeating Gladstone’ Home Rule bill are referenced in the House of Commons. THE SECRETARY OF STATE FOR THE HOME DEPARTMENT (Mr. CHILDERS) (Edinburgh, S.) I will read to the House, in reply to the hon. Member’s Question, the whole of the information which has reached me from my right hon. Friend the Chief Secretary. My right hon. Friend telegraphed to me at 1 o’clock this afternoon the following:— In addition to the statement made by me in the House last night, the only official information received goes to show that the rioting was continued in Belfast last night over a more extended area than on the previous night, that all available police and military were employed, and that there were no fatal results. One policeman is reported to have been shot in the face. We have a large number of very experienced magistrates in Belfast, and every requisition made by them has been promptly attended to. There are now over 1,600 constabulary in the town, the normal force being 502, and the military have been augmented by 250 men despatched from Dublin last night. I received a second telegram at 4 o’clock this afternoon, which is as follows:— Further telegrams from Belfast show no material change of any sort. 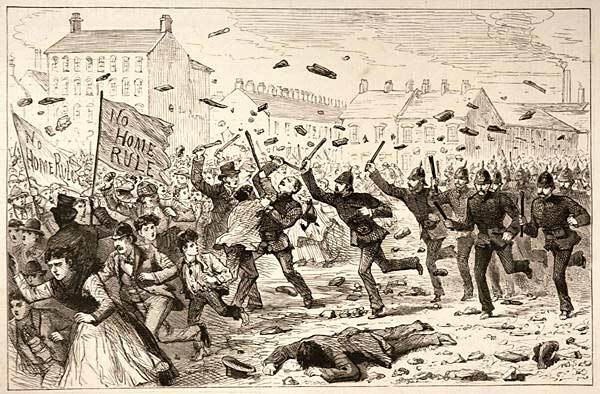 The most serious rioting last night took place at York Street and Henley Street, at the junction of which the police were obliged to fire on the mob who were stoning the police and wrecking houses, and several men were more or less injured, but none seriously, so far as at present ascertained. Several of the police were knocked down before they fired. The rioting spread to other parts of the town, and several public-houses were wrecked and liquor carried away. This rioting was more directed against public-houses than against the police. Public-houses will be closed this evening, and the Mayor will 1491 issue a notice with a view of preventing assembling of people in the streets. That is every word I have received from the right hon. Gentleman, and I am unable to answer anything further. 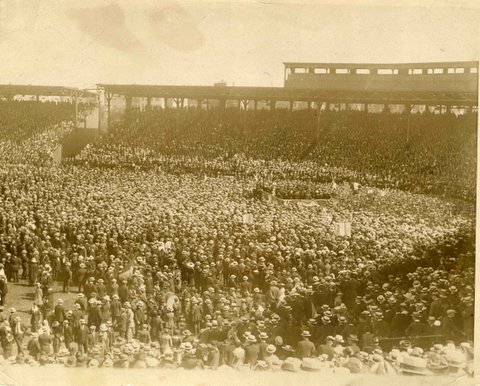 Ireland plays England in its first ever match in the World Cup Finals. England took an early lead courtesy of master poacher Gary Lineker. Ireland, under the managership of “Big Jack” Charlton (who had won a World Cup medal with England 1966) fought back to equalize with a goal by Welsh-born Kevin Sheedy. Irish football authorities took advantage of FIFA rules which allowed anyone with an Irish born parent / grandparent to play for Ireland. A soccer mad Irish nation didn’t care as Ireland came to a complete stop during Italia 90. In an amazing journey, Ireland managed to qualify for the quarter finals without winning a game! Draws against England, Egypt 0-0, Netherland 1-1 and finally a penalty kick victory 5-4 agaisnst Romania after another 0-0 draw saw Ireland matched against hosts Italy in Rome. The dream ended after a 1-0 defeat.